Wheter you are on the nerf war or just testing to shot out some nerf gun, this nerf is good for you who need a nerf with power. Stay mobile with this streamlined, lightweight Rapidstrike CS-18 blaster! 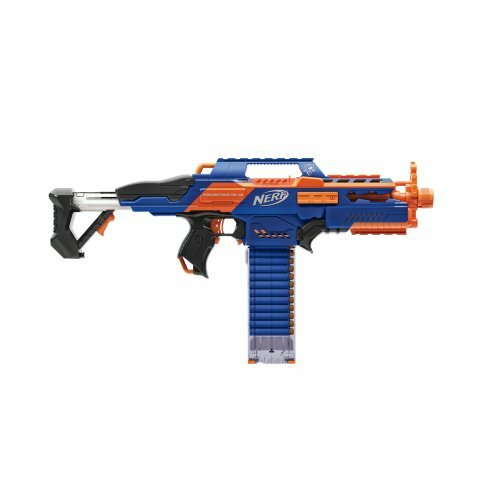 The Nerf N-Strike Elite RapidStrike CS-18 Blaster gives you serious rapid-strike firepower. Spray a blanket of cover fire or go on the move with an all-out blitz! The blaster’s Acceleration Trigger powers up the motor for super-speed firing. The clip holds all 18 of the included Elite Darts and it’s see-through so you can do instant firepower checks! With a range of up to 75 feet, you’ve got long-range striking power and a lightning rate of fire. Get maximum mission mobility with the Rapidstrike CS-18 blaster!